It’s amazing how sticky these videos are. They were created in the 1970s and are hopelessly dated — The Beatles, The Monkey’s, Chubby Checker? Jukeboxes at the drugstore that operate for a dime? But everyone who watched Saturday morning cartoons in the 70s is at least familiar with Schoolhouse Rock. It’s amazing how many still know these songs by heart! The tunes are catchy and the concepts simple. 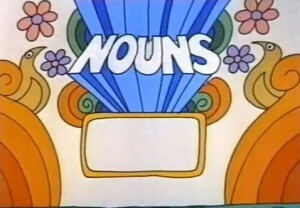 Of course, this one on nouns is overly simple. It addresses only concrete nouns: the names of people, places, and things. It doesn’t mention abstract nouns like vision, hope, and psychiatry. That’s fine, though. It’s easiest to learn concrete nouns first and add those tricky abstractions later. My only real criticism is that the song muddies the definition. A noun isn’t actually “a person, place, or thing.” It’s “the name of a person, place or thing.” I’m not a noun. My name is a noun. The words man, teacher, husband, father, blogger, and entrepreneur are nouns. But the this guy typing away on a keyboard isn’t a noun. Noun refers only to words, so don’t make the mistake of telling your kids that they live in a world of nouns. That’s weird. Does this cartoon bring back memories? Do you know all the words? Tell us in a comment!